I have been seeing recipes for bark since I started food blogging and I have always wanted to try making some. Bark seems to be pretty simple in concept, being chocolate that is melted and then topped with goodies. After the chocolate has cooled it is broken into pieces that I guess resemble pieces of bark. With the cranberry, pistachio and white chocolate combo still fresh on my mind I figured that it was the perfect time to try making some holiday bark. I decided to mix the cranberries and pistachios into the melted chocolate rather than just sprinkling them on top as I figured the bark would hold together better. The cranberry, pistachio and white chocolate bark turned out great! 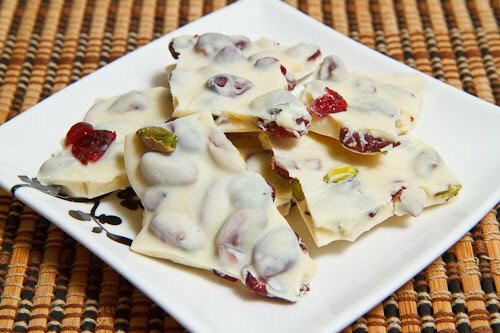 I used some good quality white chocolate that was nice and creamy and it felt like it was just melting in your mouth and it went perfectly with the cranberries and pistachios. Given the simple concept of bark, there are near endless possibilities. Peppermint or candy cane bark seems to be another popular bark recipe around the holidays. A while ago when I was having trouble finding the bacon chocolate bar that I had heard about I was seriously considering melting down some good dark chocolate and making some bacon bark! Bacon bark aside, I am looking forward to experimenting with bark some more. Mix in the cranberries and pistachios. Pour the chocolate into a parchment paper lined baking sheet and smooth it out. Let cool and set completely on the counter or in the fridge. Thank you!! I have all of these in my pantry!! Your bark looks wonderful! I have been wanting to make bark for the longest time. I have even bought the ingredients and still have not made this tasty treat. You are inspiring me! I have made peppermint white chocolate bark and chocolate peanut clusters bark….that's my favorite, so far. Now, let me tell you about something that might not sound all that great but it is DELICIOUS. Make several peanut butter and cracker sandwiches…, using RITZ crackers. Then, melt your white chocolate in the microwave….dip each pb cracker in the candy, covering as much as possible…let them dry on Pam sprayed foil…O honey…these are really good. Ooooh, I just came from a post on white chocolate fudge with cranberries and pistachios! This is really driving the idea home! Lovely sweet. Happy HOlidays! A wonderful treat! What a great combo! Oh my mom makes this all the time! Only, she uses macadamia nuts instead of pistachios. She had some waiting for me when I flew in- YUMMY! Looks wonderful! I love it! Happy Holidays! The barks look nice & lovely!! They also look awesomely delicous! Dear Kevin, I wish you & your Family a happy & lovely Christmas!! Enjoy!! The first thing I did when I saw this post was say, "Oh YUM," out loud 'cause that just looks so good. I agree about trying it with roasting the pistachios first–they taste even better that way, as most nuts do when they're roasted. I am absolutely in love with the white chocolate/cranberry/pistachio combination. Actually, white chocolate and I are best friends these days in general. Not sure why. This bark sounds delicious! Heaven in a bite. Love this recipe! What I like best in the creativity it offers. Can't wait to try some flavor combinations…what about a little lavender along with dried blueberries or dark cherries? yum yum! Cranberry and pistachio bark sounds very good. Here is a great chocolate cheesecake recipe. Very festive Kevin. Have a great Christmas. Oh how pretty to make it w/ red and green! What a delicious, beautiful idea that would make great gifts! I'm fairly new to your blog Kevin …and enjoying all the recipes…. This recipe looks delicious. I have never eaten this. I will be trying this next week for sure. love this. reminds of a much better version of Starbucks' cranberry bliss bar, which i love! Did you have to temper the white chocolate? Anonymous: You do not need to temper the white chocolate. You are heating it in a double boiler to prevent it from burning. Once it has melted you just mix in the pistachios and the cranberries. what a great combo. Can't wait to try it. Looks so yummy! A cup of coffee would be great with these. Man, why didn't I see this before the holidays were over? What a delicious bark. Some of my favorite munchies all rolled into one! That is a totally classic combo and one of my favourites. Looks wonderfully festive too! Oh God, it looks so good! And the ingredients are just delicious. I have to try it and I think it will become my new favourite.